Ferrets (and Family) Gone Wild! Sometimes domestic chaos just happens — the kids eat their entire Halloween stash in one sitting, your wife breaks a wrist (or two), or your mother in law moves in for nine months. And sometimes you bring it on yourself. That’s what happened yesterday as we adopted two ferrets. Why ferrets as opposed to, say, guinea pigs, hamsters, gerbils, or rats? Or another dog for that matter? Good question. Obviously the boys were involved in this since owning a ferret was never a childhood fantasy of mine. Fortunately, I have someone to blame for introducing the boys to these carnivorous mammals (they’re not rodents — who knew?). Bryna’s friend and co-worker Jen has two ferrets named Mahi and Fenway. Bryna and the boys spent a day with her in Southie and their take-a-way was “ferrets are wicked cool!” followed by “when are we getting ferrets?” Thanks, Jen. They even came up with names on the ride home: Casper for a boy and Mimi for a girl (while soundly rejecting my suggestion of “Ferret Beuler”). The incessant lobbying had begun in earnest. Mahi and Fenway were given an invitation to our early October Blessing of the Animals (Bryna’s ulterior motive was to get them to meet Delilah and see how a dog would react to ferrets — just fine it turned out). 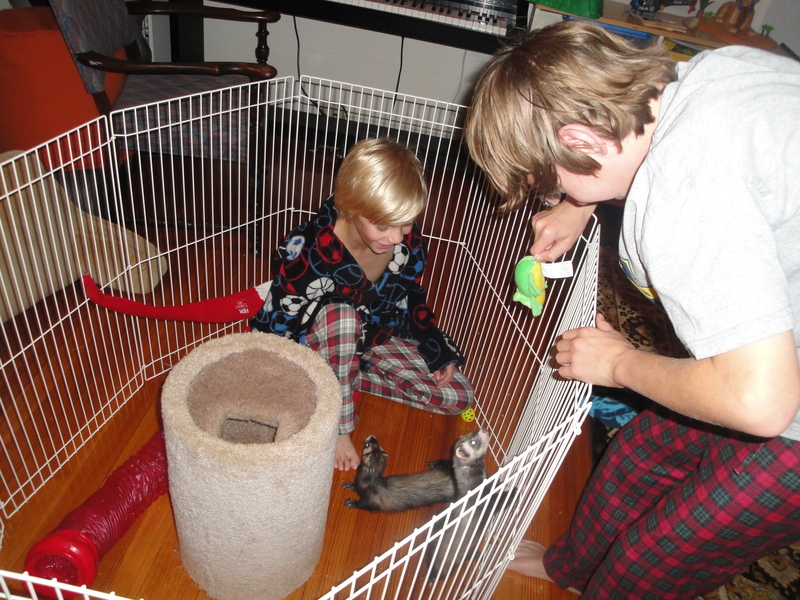 The next thing I knew the boys were spending inordinate amounts of time on ferret adoption websites. It didn’t help when Jen gave them the most recent issue of Ferrets Illustrated (or whatever it’s called). Now they were getting educated, Bryna was being sucked in, and the next thing I knew she and the boys had ordered a gargantuan ferret cage online. Do you have any idea how ridiculous it feels to have a ferret skyscraper being delivered to your home in 3-5 days with no ferrets in sight? Fortunately (I guess, since I was now resigned to my ferretorious fate), Bryna made contact with a woman in Rhode Island who had two ferrets for whom she was seeking a good home. Between work and a new baby they just couldn’t give their ferrets (a one-year-old girl and a two-year-old boy) the attention they both crave and deserve. So the whole family, including Delilah, piled into the minivan for the hour-long drive to meet them. The boys and the ferrets took to one another instantly, Delilah sniffed them if not approvingly then at least non-threateningly, and we left with two ferrets and a bunch of supplies and toys. I have to admit they are incredibly adorable — lively, curious, engaging, mischievous — and they bring out the best in the boys — sensitivity, responsibility, affection. They also sleep for about 19 hours a day which is a plus. Chaos is a multi-splendored thing. 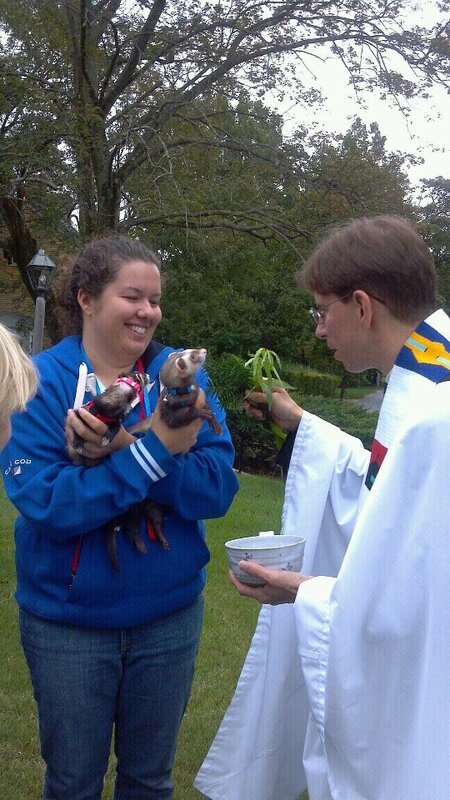 Two new ferrets simply add to the blessed mixture. The story is wonderful…and the last paragraph really sums it up beautifully! Thanks, Stephen. Never a dull moment around here! Mazel tov! Two ferrets…three times the fun!